Some version of this will be part of the upcoming new version of the Win10 Tweak Guide. This article is as much to keep my thoughts straight as it is for your info. Lately it seems every update released by Microsoft breaks something. I can no longer recommend installing Windows Updates when they are released. Instead I tell folks to wait before installing updates and watch the usual Geek sites for news on if/what the newest updates broke. To delay updates in Win10 you must be running Windows 10 Pro, Enterprise, or Education. Or, not Windows 10 Home. To open the Group Policy console press the Windows + R keys and type gpedit.msc . Navigate to: Local Computer Policy > Computer Configuration > Administrative Templates > Windows Components > Windows Updates > Defer Windows Updates. FYI there are 2 kinds of updates: Feature Updates are things like the Anniversary Update and Quality Updates are security and bugfix updates. in the Options section set the number of days to what you desire. I use 30 as a default. If you want to max out the delay which is 180 days the check the Pause feature updates box. This allows you to extend the delay by another 60 days. in the Options section set the number of days to what you desire. I use 15 as a default. 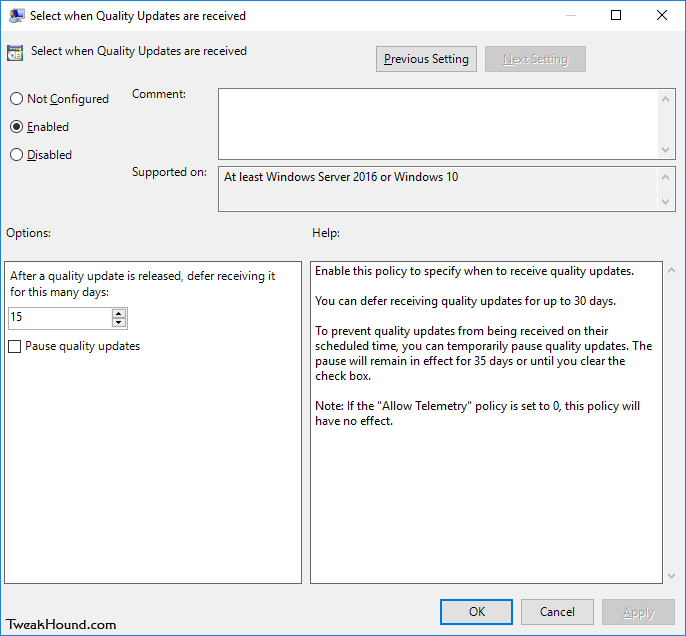 If you want to max out the delay which is 30 days the check the Pause quality updates box. This allows you to extend the delay by another 35 days. To disable driver updates via Window Update open the Group Policy console by pressing the Windows + R keys and type gpedit.msc . 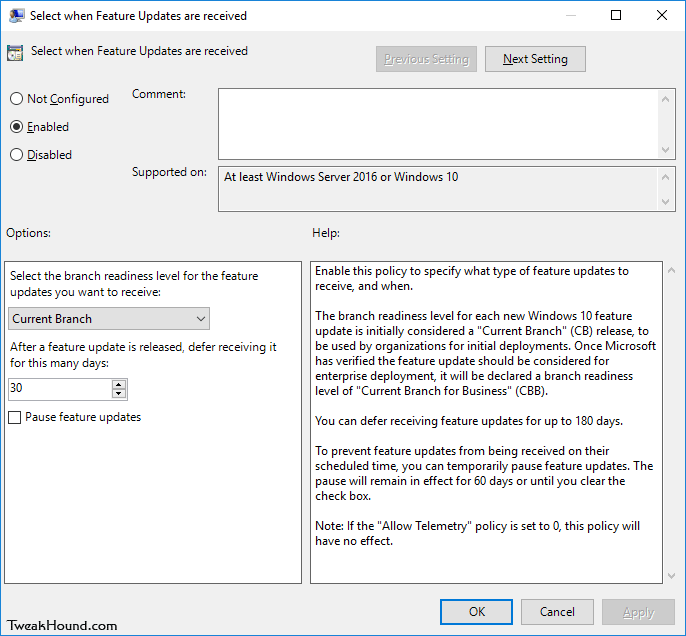 Navigate to: Local Computer Policy > Computer Configuration > Administrative Templates > Windows Components > Windows Updates. Scroll down and double-click on Do not include drivers with Windows Updates > click the radio button next to Enabled > Click Apply and OK to Save your settings. All registry entries. Maxed out. Delay and disable are 2 entirely different things. Am I the only one that hasn’t had a problem with Windows Updates ******* up my system? Since the Home version does not have the Group Policy capability. Could a person just use the registry keys instead? Disabling windows update is dumb. Your solution is a wise one. Thanks Eric. Eric: My gpedit.msc final menu is different than yours. It only says “Defer updates and upgrades”. What Win 10 version are you running? Finally, how do I find out if I have home, pro or enterprise version? I thought I have pro version that was updated from 8.1 pro. Send me a screen shot. Yes, I am running Win 10 Pro, thanks. I’ve just emailed you the screen shots. Yes, I am on AnniUpdate. curious, I have win10 home, I added gpedit (downloaded and installed), then set the windows update\”Configure Automatic Updates” to:“Notify for download and notify for install”. Do you think this will work? I’m aware that folks are installibg gpedit on Win10 home. I’ve no idea if it works, what isdues it may cause, or if updates remove it. Freaking Microsoft, bypassed my tweak, last night, and did a 40 minute update. Seems gped, doesn’t work on Windows 10 Home version! I just performed a CLEAN install of Win 10 Pro and applied your ‘Update Delayer’ tweak. Question–how do I update my brand new clean install without adding any of the iffy updates, what ever they may be. In the past, after a clean install, heading over to Microsoft Update was one of the first things I’d do, after installing drivers and such. What is your advice on updating clean installs now. I didn’t see a “Window 10 Install” article, only a “Window 10 Tweaks” article.